Spring word walls. 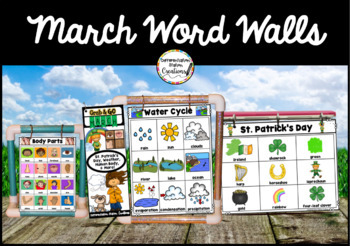 March word walls help students explore themes including: weather, parts of the body, and habitats. 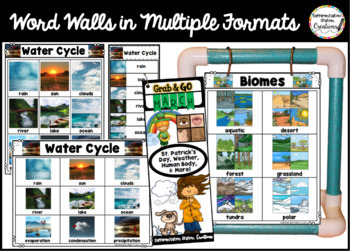 Low-prep word wall charts and word lists are easy for teachers and students to use. 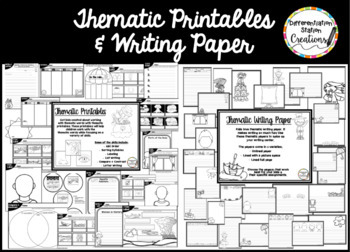 Monthly word wall sets include word lists, printables, and thematic writing paper. Portable word walls are perfect for word exploration, building vocabulary, for writing workshop and so much more! Portable word wall charts and word lists are great for young children, ESL students, and special education students. Thematic word walls provide support to help children become independent writers and thinkers. ☑ Word lists are organized into thematic categories to help students build background knowledge in thematic areas. ☑ Place word lists around the room to provide access to students. ☑ See how I use the large and small word lists→ here. 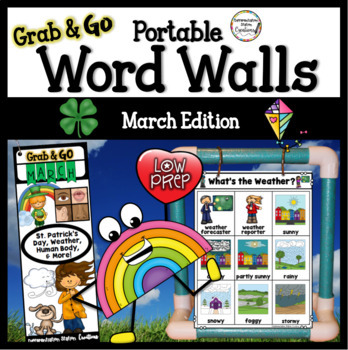 "Grab & Go Portable Word Walls: Monthly Word Lists, Printables, Writing Paper"